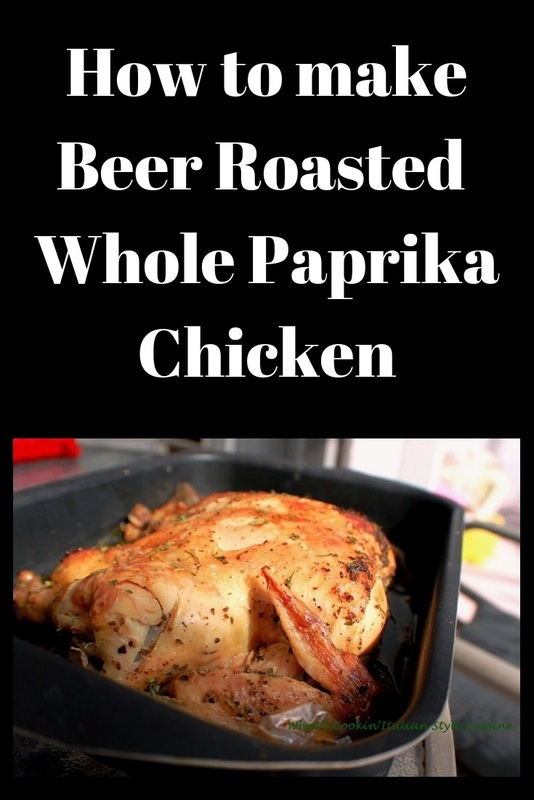 Here is a great marinade for this beer roasted paprika chicken. This will keep the roasted bird will be still moist inside but tender yet crisp outside. Great as a main meal and perfect if there are any leftovers for all kinds of salads. This even taste great cold in a sandwich! There is also another bonus recipe for chicken pieces without beer and baked to perfection. Scroll down to the recipe card for these yummy roasted chicken recipes. 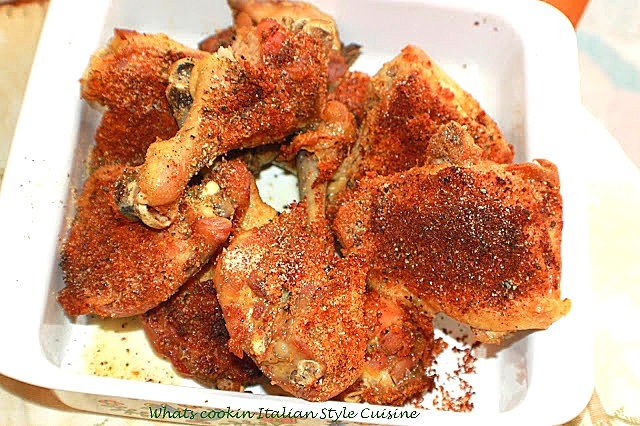 This beer baked chicken with paprika is so tender and moist and the juice is very flavorful. This chicken just melts in your melts it's roast perfectly in a large baking bag or in a roasting pan with a tent of foil. Either way the beer keeps this roasted whole chicken juicy throughout the whole bird. You can find these large roasting bags just about at any supermarket. I like the ease of clean up and the way it tenderizes any kind of meat that's cooked in them. Since we eat a lot of chicken, this is one of the best tasting whole roasted chickens with lots of flavor recipe. 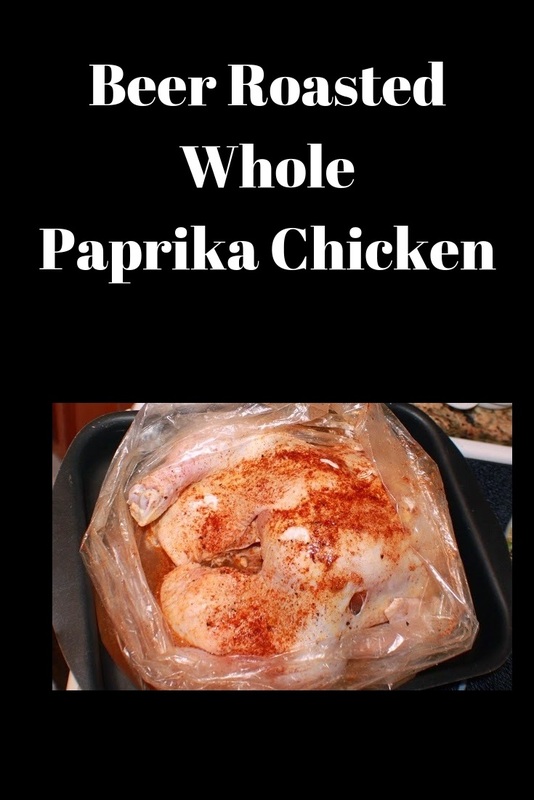 I have two recipes below and they are great with both whole chicken or pieces, however they are both completely different methods and recipes for you to choose from. Although you can use the same recipe and method for pieces, I find that the cut up pieces are not as tender with the same process. 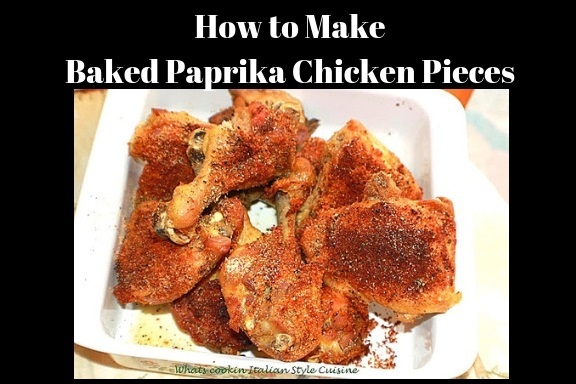 Below you will find a baked paprika chicken recipe for using just pieces of the chicken parts. There are different ingredients for those Chicken pieces and doesn't use any beer. We love both recipes and you can choose the one you would likely use the most. 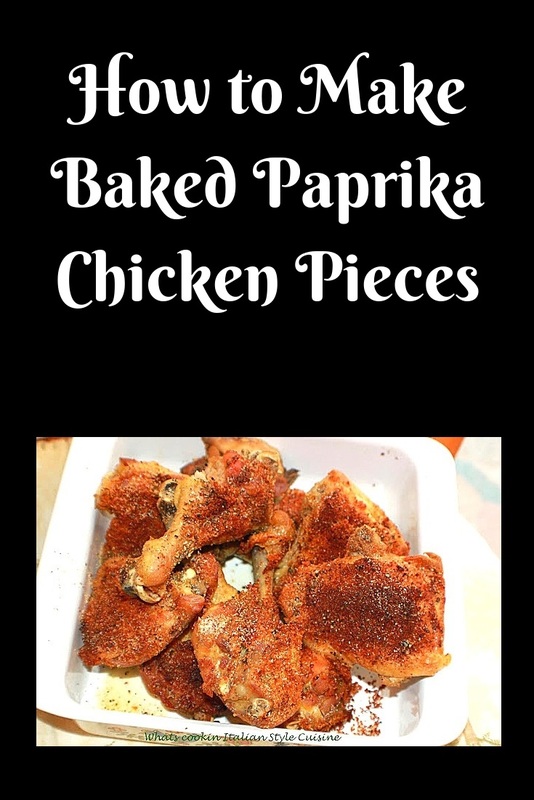 The baked chicken is crispy, moist and full of delicious smoked flavors from the paprika. I would recommend either recipe depending on what your family likes. 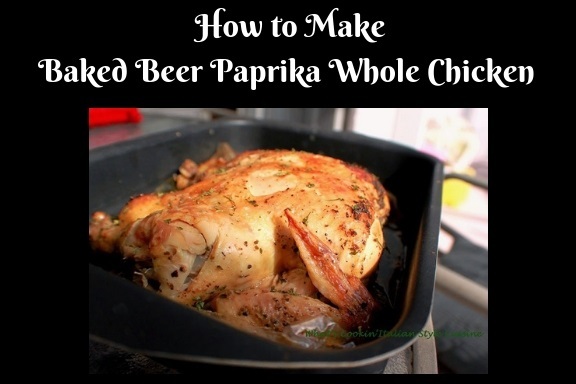 Either way beer roasted or plain paprika chicken is a delicious way to serve chicken. Not the one your looking for? This is a baked beer roasted paprika chicken. I use either a whole chicken or chicken pieces. Showing two styles. Place all ingredients in the plastic bag. Add the chicken. 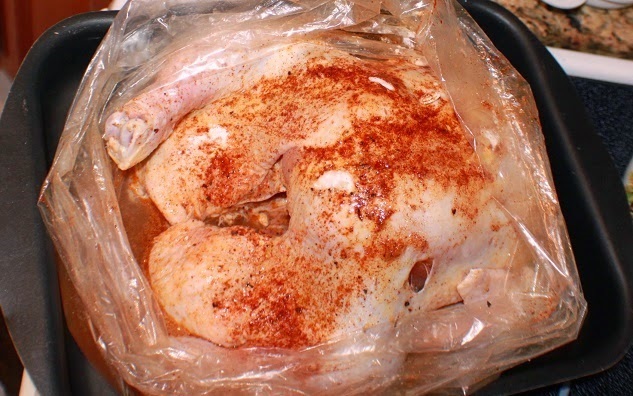 Place in the refrigerator for at least 3 hours before cooking or marinade over night. Pour half the marinade out. Place whole chicken in the bag, in a large roaster pan . Roast chicken at 350 degree hot oven in a greased roasting pan basting often around every 1/2 hour. Cook the bird 1/2 hour per pound. Cool before opening the bag cutting large slits in there before removing the chicken. Heat oven to 350 degrees. Coat a baking pan with oil spray. Place flour, cheese, paprika, salt, pepper in a bowl. In a pie plate whisk egg and milk. Dip chicken in egg mixture and then into flour mixture. Place on greased baking pan then drizzle with oil or butter over chicken. Bake until juice run clear and cheese has browned around 1 hour. Try My Pizza Chicken And Potatoes Recipe! It's Fabulous!!! 10 comments chicken, marinade, roasted, smoked, whole chicken. I love a heavy dose of paprika. This looks delicious. going to make it soon. I love the flavor of beer with chicken. This recipe sounds easy and so delicious- perfect for a cold night! 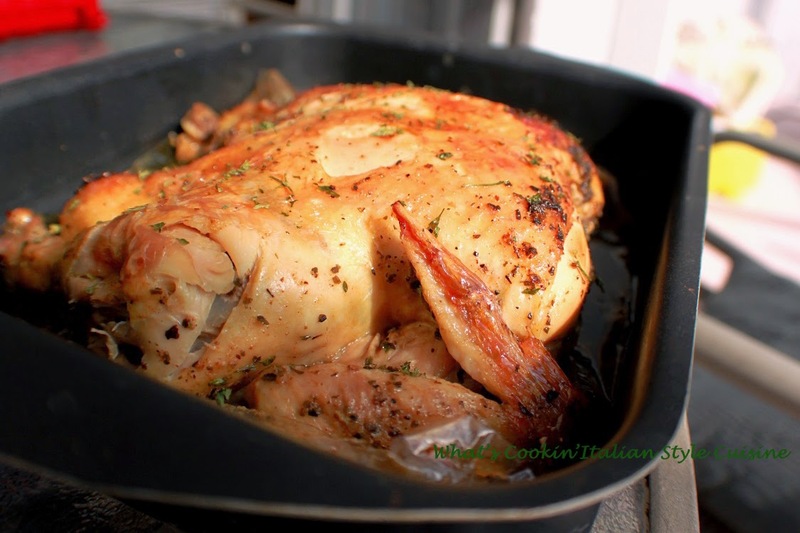 This chicken looks so warm and comforting! Yummy! Would love to try this! This made me drool. Thank you for a great recipe! Holidays are coming and I need interesting recipes. And YES! your chicken recipe looks sooooo good! Love the unique flavors in this recipe! YUM! I've never marinated chicken in beer before! I've cooked with beer and we've made drunken chicken but marinating it? Nope. I bet it really gives the roasted chicken a fantastic flavor. I like the seasoning that you use. Very complimentary to the chicken. I imagine the aroma from the roasting chicken is amazing!! I love adding beer to roasting meat and chicken recipes. This is so simple and easy. Love the color of the paprika on top. Sounds yum.
. I would love to try this recipe soon. Oh these flavours sound amazing together, and beer?YES PLEASE ha! We always have whole chickens in the freezer so I can cook it on a Sunday and have leftovers for a couple days lunches. This looks so good! I'm saving it. I love a good roasted chicken recipe. I haven't tried roasting chicken with beer but first time for everything. Can't wait to try it!